How Does Modern Whitening Work? The first publications describing techniques and chemicals for bleaching “non-vital” (root canal treated) teeth appeared in the latter half of the 19th Century. The bleaching agent of choice was chloride of lime. Other agents described for the bleaching of non-vital teeth included aluminum chloride and hydrogen peroxide, used either alone or in combination with heat. The active ingredient common to all the early medicaments was an oxidizing agent. Concern about the side effects of some of these agents was justified because some chemicals used were very poisonous, such as cyanide of potassium. The observation that carbamide peroxide caused lightening of teeth was made in the late 1960s by an orthodontist (Klusmier), who had prescribed an antiseptic containing 10% carbamide peroxide to be used in a tray for the treatment of gingivitis (inflammation of the gums). Believe it or not, this technique pioneered the method of home bleaching today, which only achieved general acceptance decades later. In a nutshell, carbamide peroxide and its breakdown products, hydrogen peroxide and urea bleach the colored organic molecules between the enamel crystals and in the dentin therefore leaving the teeth whiter looking. 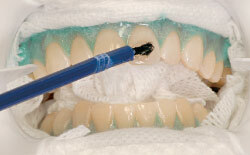 Figure 1: A patient undergoing in-office whitening treatment. Sometimes known as “Power Bleaching,” this is the procedure of choice for whitening teeth. It is indicated where general whitening of the teeth is required but especially for severely stained teeth, for example by tetracycline, or prior to veneering or crowning teeth where severe discoloration is present. The whitening of the external surfaces of vital (living) teeth accomplishes complete lightening during treatment in the dental office under direct supervision of the dentist. Power bleaching of vital teeth generally uses a high concentration of peroxide solution, (35-45% hydrogen peroxide) placed directly on the teeth, often supplemented by a heat or light source to activate or enhance peroxide release [Figure 1]. Figure 2: In-office whitening procedures begin by protecting your lips, gums and mouth, leaving only your teeth exposed for the application of the whitening gel. These systems use a gel applied with custom tailored trays specially fitted to the individual's mouth. When using the stronger professionally applied agents the dentist will isolate the gums and membranes (skin) of the mouth with a “rubber dam,” silicone barrier material or protective gel to prevent irritation [Figure 2]. When activated by mixing the components of the gel, hydrogen peroxide gas is liberated which is responsible for the whitening effect. The better systems contain a buffer which keeps the gel from becoming acidic thereby preventing damage to the enamel. Dull to bright in minutes. The combination of chemicals in the gel can lighten teeth up to ten shades in about an hour. Most testers have recorded an improvement of three to eight shades and note that some people may need up to four treatments to achieve the level of whiteness they desire. There are several professional bleaching systems available all with slight variations in the bleaching gels, light systems as well as the time and number of applications required to produce the appropriate level of lightening.